73th STLE (Society of Tribologists & Lubrication Engineers) conference, gathering scientists and engineers from all over the world, was organized in Minneapolis, USA between May 21-24. 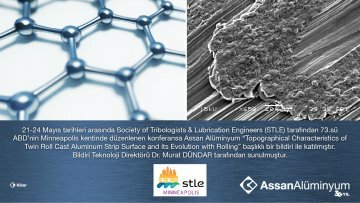 Assan Aluminum participated in this conference with a paper titled: “Topographical Characteristics of Twin Roll Cast Aluminum Strip Surface and its Evolution With Rolling”. It was presented by Murat DÜNDAR, Ph.D., Technology Director of Assan Alüminyum.